Cl- absorption and HCO3- secretion are intimately associated processes vital to epithelial function, itself a key physiological activity. 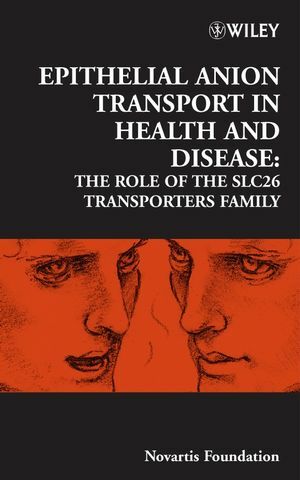 Until recently the transporters responsible remained obscure, but a breakthrough occurred with the discovery of the SLC26 transporters family. It is now clear that the SLC26 transporters have broad physiological functions since mutations in several members are linked to a variety of diseases. This book describes the properties of this family in detail, with contributions from the leading global researchers in the field. Complementary views from experts on other ion channels are offered in the discussions, which make fascinating reading. This family consists of at least 10 genes, each of which has several splice variants. Most members of the family are expressed in the luminal membrane of epithelial cells. Characterization of anion transport by three members has revealed that all function as Cl-/HCO3- exchangers, suggesting that SLC26 transporters are responsible for the luminal Cl-/HCO3- exchange activity. The SLC26 transporters are activated by the CF transmembrane conductance regulator and activate it in turn, leading to a model in which these molecules act together to mediate epithelial Cl- absorption and HCO3- secretion. The book includes chapters on the transport of other molecules by the SLC26 family, including oxalate in the kidney and sugars in cochlear hair cells amongst others. It also describes recent discoveries that most SLC26 transporters bind to scaffold proteins and that they all contain a conserved domain predicted to participate in protein-protein interactions. These suggest the SLC26 transporters exist in complexes with other Cl- and HCO3- transporters, and possibly other regulatory proteins. This book explores the functional role of these interactions, leading to better understanding of transepithelial fluid and electrolyte secretion and the diseases associated with it. Overview of the SLC26 family and associated diseases (Juha Kere) . Individual characteristics of members of the SLC26 family in Vertebrates and their homologues in insects (Marlies Knipper, Thomas Weber, Harald Winter, Claudia Braig, Jelka Cimerman, Juergen T. Fraenzer and Ulrike Zimmermann). Sulfate transport by SLC26 transporters (Daniel Markovich). Sugar transport by members of the SLC26 superfamily (Jonathan Ashmore and Jean-Marie Chambard). SLC26A3 and congenital chloride diarrhoea (Pia Höglund). Expression, regulation and the role of SLC26 Cl-/HCO3- exchangers in kidney and gastrointestinal tract (Manoocher Soleimani). Anion exchangers in flux: functional differences between human and mouse SLC26A6 polypeptides (Seth L. Alper, Andrew K. Stewart, Marina N. Chernova,Alexander S. Zolotarev, Jeffrey S. Clark and David H. Vandorpe). Physiology of electrogenic SLC26 paralogues (Michael F. Romero, Min-Hwang Chang, Consuelo Plata,Kambiz Zandi-Nejad, Vadjista Broumand, Caroline R. Sussman and David B. Mount). Role of SLC26-mediated Cl-/base exchange in proximal tubule naCl transport (Peter S. Aronson). SLC26 transporters and the inhibitory control of pancreatic ductal bicarbonate secretion (Péter Hegyi, Zoltán Rakonczay Jr., László Tiszlavica, András Varró,András Tóth, Gábor Rácz, Gábor Varga, Michael A. Gray and Barry E. Argent). Regulatory interaction between CFtR and the SLC26 transporters (Nikolay Shcheynikov, Shigeru B. H. Ko, Weizhong Zeng, Joo Young Choi, Michael R. Dorwart, Philip J. Thomas and Shmuel Muallem). Lorraine A. Everett new insights into the role of pendrin (SLC26A4) in inner ear fluid homeostasis (Antonella Forlino, Benedetta Gualeni, Fabio Pecora, Sara Della Torre,Rocco Piazza, Cecilia Tiveron, Laura Tatangelo, Andrea Superti-Furga, Giuseppe Cetta and Antonio Rossi). the renal physiology of pendrin (SLC26A4) and its role in hypertension (Susan M. Wall). Interaction of prestin (SLC26A5) with monovalent intracellular anions (Dominik Oliver, Thorsten Schächinger and Bernd Fakler).